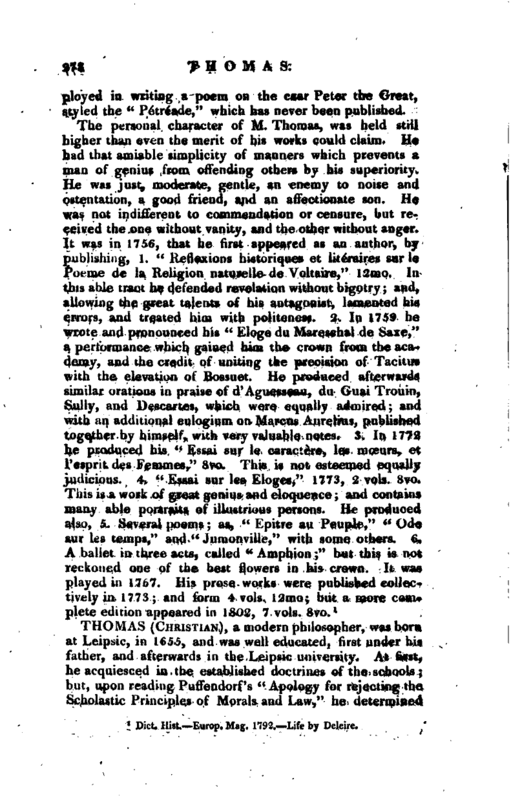 , a member of the French academy, was born in 1732, at Clermont in Auvergne, the country of the celebrated Pascal. He received from his mother a severe, and almost a Spartan education. The three children of that estimable woman were brought up chiefly under her own eyes. His two elder brothers died, the one in 1748, the other in 1755, both young men, and both having signalized themselves in literature. Jo­Seph, the eldest, had produced a comedy; and John, the second, excelled in Latin poetry. The death of his second brother, impressed Antony very early with a strong sense of the vanity of worldly cares; and with a profound piety ^ which enhanced the value of his character. He had a decided taste for poetry, but was designed for the bar. In obedience to the wish of his mother, he went to Clermont, to follow a study repugnant to his taste; but going with her to Paris, when John was at the point of death, his friends offered him a professorship in the qoliege of Beauvais. This, therefore, he accepted, as more congenial to his feelings, though less splendid in appearance, than the profession for which he had been designed. 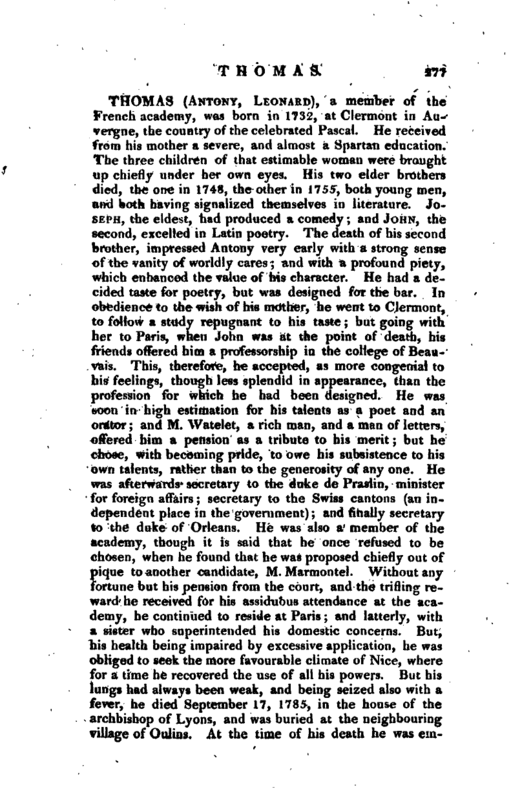 He was soon in high estimation for his talents as a poet and an orator; and M. Watelet, a rich man, and a man of letters, offered him a pension as a tribute to his merit; but he chose, with becoming pride, to owe his subsistence to hi own talents, rather than to the generosity of any one: He was afterwards secretary to the duke de Praslin, minister for foreign affairs; secretary to the Swiss cantons (an independent place in the government); and finally secretary to the duke of Orleans. He was also a member of the academy, tho-ugh it is said that he once refused to be chosen, when he found that he was proposed chiefly out of pique to another candidate, M. Marmontel. Without any fortune but his pension from the court, and the trifling reward he received for his assiduous attendance at the academy, he continued to reside at Paris; and latterly, with a sister* who superintended his domestic concerns. But, his health being impaired by excessive application, he was obliged to seek the more favourable climate of Nice, where for a time he recovered the use of all his powers. But his lungs had always been weak, and being seized also with a fever, he died September 17, 1785, in the ho,use of the archbishop of Lyons, and was buried at the neighbouring village of Qulins. At the time of his death he was | employed in writing a poem on the czar Peter the Great, styled the “Pe*treade,” which has never been published. Dict. Hist.—Europ. Mag. 1792.—Life by Deleire.